I spent yesterday wandering around what has easily become one of my favorite cities. I’ve got two weeks and two days left to say that I’m a resident of the Frankfurt area, so I’m trying to soak up every moment possible. I walked down Kaiserstraße, through the Zeil area, next to the Dom Römer, across the river on the Eiserner Steg (the bridge covered in locks), and along the banks of the Main River. In my opinion, the best part of the city is that it is situated around a body of water, and there’s nothing like being able to sit along the bank of that river and enjoy a sunny day. 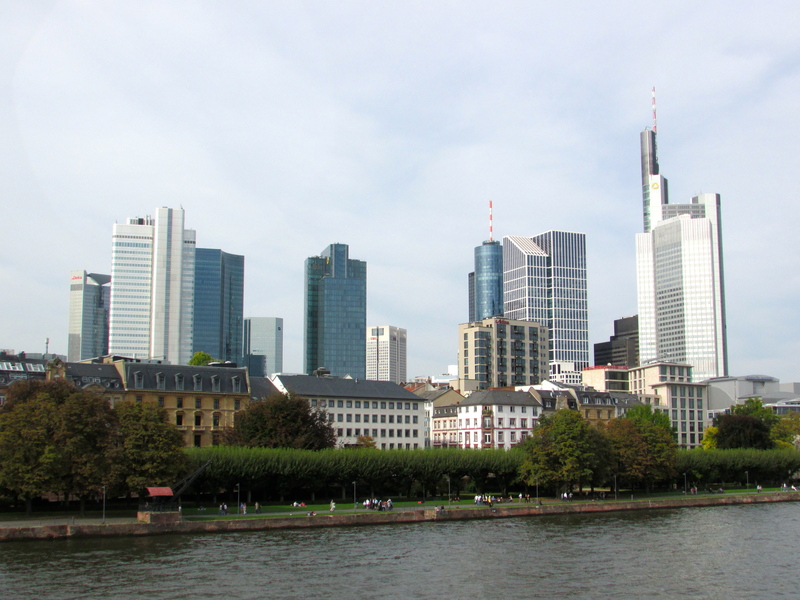 I also enjoy the face that Frankfurt still isn’t very touristy, but it’s a big international city, so you don’t often have to deal with massive groups of people. I read an article months ago about the ex-pat life, and how it’s hard to really feel like you completely fit in back home after living in another country. I haven’t even moved back yet, but I’m already starting to feel that way. While the German culture isn’t as different from the American culture as some others might be, there are still many differences. I’ve gotten fond of the language barriers because I feel a strong sense of pride when I understand and can answer questions. My diet has completely changed, and the idea of throwing all of my trash in one big bin seems almost foreign now. Because of the heavy British influences in my friendships, some of the words I use in everyday language is different, and some people have even pointed out that my accent has changed somehow. Even now while I sit writing this, I think I’ll miss the German way of living far more than I would ever miss the American one. Of course, whenever you go through a big move, you simultaneously go through a big change. If you chose to move back to your original location, it will never the same. You may look the same and you may continue to enjoy the same friendships, but you as a person will have grown and changed. With an international move, that change will inevitably include an expanded worldview. I’m not looking forward to moving back to Texas (even though I know it’s just a temporary move) for that very reason. I’m excited to see friends and family, but I know I’m not the same person that I was when I moved away. In some ways, I feel like they might be meeting an entirely different person. At the risk of sounding conceited or overly proud or whatever you might call it, I feel like I’ve gained a sort of quiet confidence. I’ve become even more independent than before, and I know that the limits I used to believe were holding me back are now mostly nonexistent. I will have only been gone for nine months, but when you move away like I did, you’re forced to hit the fast forward button on changing and maturing. F. Scott Fitzgerald wrote, “I’m not sure what I’ll do, but — well, I want to go places and see people. I want my mind to grow. I want to live where things happen on a big scale.” This sentiment is one of the biggest reasons I want to travel and live in different places and immerse myself in different cultures- I want to grow. I don’t want to be stuck in some small town and keep a small worldview. It’s been so long since I’ve lived in Alaska that I’m not expecting anything to be as it was when I was a child. I’m excited to be back because I know there will be struggles and lessons to go through. Of course, the gorgeous scenery and a wonderful man are big things to look forward to, but most importantly, it’s a chance for me to grow even more. It’s time for that next chapter.